After completing two years of study at the Minneapolis College of Art and Design, Dowlatshahi transferred to the School of Architecture at the University of Minnesota and earned two bachelor’s degrees, in Architecture and Environmental Design. Red Balcony reflects the artist’s interest in schematic drawings. The brick pattern in the background is unusual; most of his other works from the same period in the NYU Art Collection employ a squared grid. 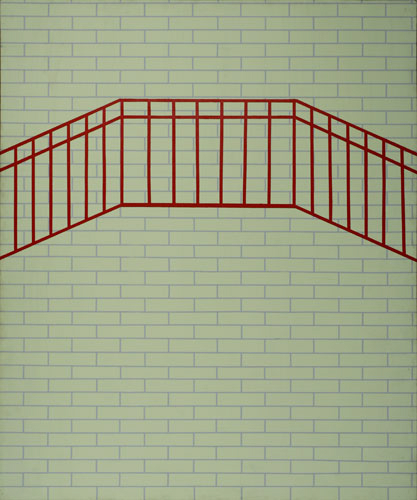 The bridge-and-brick motif was inspired by a Persian miniature shown to the artist by his teacher Siah Armajani, which Dowlatshahi then adapted to create this painting. Dimensions 84 x 70 in.